My name is Ilan, and I am one of Shaper's co-founders and a mechanical design engineer. For this month’s update, I’d like to walk you through how we developed and built an easily overlooked, but important, mechanical element: the Z Axis. What is a Z Axis? In the world of machine design, an "axis" is simply a direction in which a machine is able to move in a controlled way. Multiple axes are typically added together to allow motion in a plane or in three-dimensional space. Origin is a three-axis machine: the X and Y axes are responsible for adjusting the position of the cutting tool as you move to ensure that your cuts remain accurate, while the Z axis allows Origin’s spindle to automatically move up and down. Origin has the ability to plunge to a precise depth as well as to rapidly retract. The Z axis enables you to simply type in a desired plunge depth on the touchscreen and Origin will go precisely to that position at the start of a cut. Should you inadvertently move Origin outside of its corrective range while cutting, the bit will rapidly retract to minimize damage to your project. A core component of the Z axis is the carriage. The carriage is the aluminum ring that clamps onto the cylindrical body of the spindle and carries it up and down. Linear bearings housed in the carriage constrain motion to only the desired vertical direction while rigidly resisting sideways cutting forces. 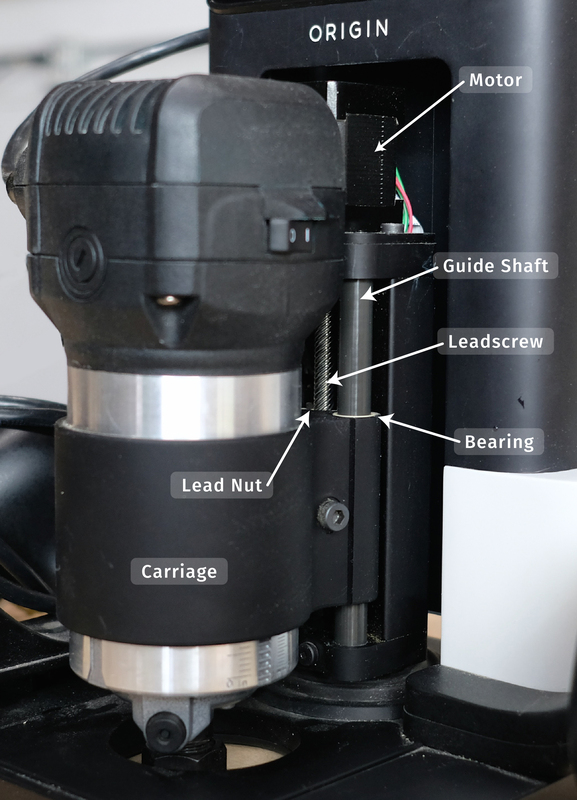 To achieve accurately controlled plunge depths and rapid retraction, a stepper motor spins a leadscrew, which in turn precisely raises or lowers the carriage on precision guide rails by means of a low-friction polymer nut. Because all of this is moving as Origin corrects in the X and Y directions, the entire Z axis must fit within a very compact envelope so that it doesn't collide with the rest of the tool. Our very first prototype was a single-axis device that could automatically move the spindle side-to-side to compensate for a user’s motion, but it could not move forwards and backwards. (For more on our first prototype, see "A Brief History of Origin"). We quickly changed to a two-axis XY design. While this technically worked fine, the user still needed to adjust the cutting depth of the tool manually and to perform a somewhat sketchy maneuver called tilt-plunging to drop the spinning bit into the wood. When we moved on to our “B” prototype, we added in the Z axis. It was simple and worked well, but, through our ongoing beta testing program, we realized there was room for improvement. The first area had to do with the type of linear guide rail we were using and sawdust. We originally picked what's called a linear profile rail, which is an accurately ground steel rail on which a steel block slides up and down. In between the block and the rail there are recirculating tracks of tiny ball bearings. This style of bearing is precise, is essentially frictionless, has no play, and can withstand significant loads. Sounds perfect, right? Almost. The Achilles heel of small profile rails is debris. If even a small amount of sawdust manages to get past the seals - which is inevitable because of the complex cross-section of the rail - the balls stop rolling, and the entire bearing comes to a grinding halt. To address the dust issue, we switched to an improved bearing system riding on steel shafts. Secondly, we decided to work on retraction speed. The faster the spindle can retract, the safer your workpiece is from potential damage. To increase retraction speed, we upgraded to a stronger motor with a more aggressive (i.e. travels further per revolution) leadscrew. All of this brings us to our current pre-production “C” prototype, first revealed in our launch videos. The next major milestone is the engineering validation testing build. Unlike our prior rounds of prototypes, the upcoming batch of machines will be the first to be made on a production manufacturing line using primarily tooled components. As part of the lead-up to this build, we are now running our production-intent design - including the Z axis - through rigorous lifetime testing to ensure that Origin provides its owners with reliable and durable service. Thank you for your support. If you have questions please send us an email or drop us a line on social media. It’s a very exciting time and we’re glad you are along for the ride.